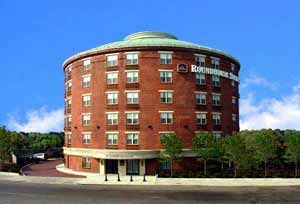 Best Western Boston Roundhouse Suites Hotel in the South End of Boston. Located in Boston's South End, the Best Western Roundhouse Suites is an all-suites hotel. All 92 suites feature a sitting area with a sofa bed, arm chair and work desk, a wet-bar with microwave and refrigerator, coffee/tea maker and sink, three 2-line dataport telephones, in-room safe, 27-inch television, pay-per-view movies, iron and ironing board and a hairdryer. Executive Suites with French doors. On-site fitness center and 2 meeting rooms. This and other Best Western Boston Suite Hotels can be found here online in The Register. A warm comfortable round house room can make for a great vacation or business travel day!